What Would You Do For Five Dollars? 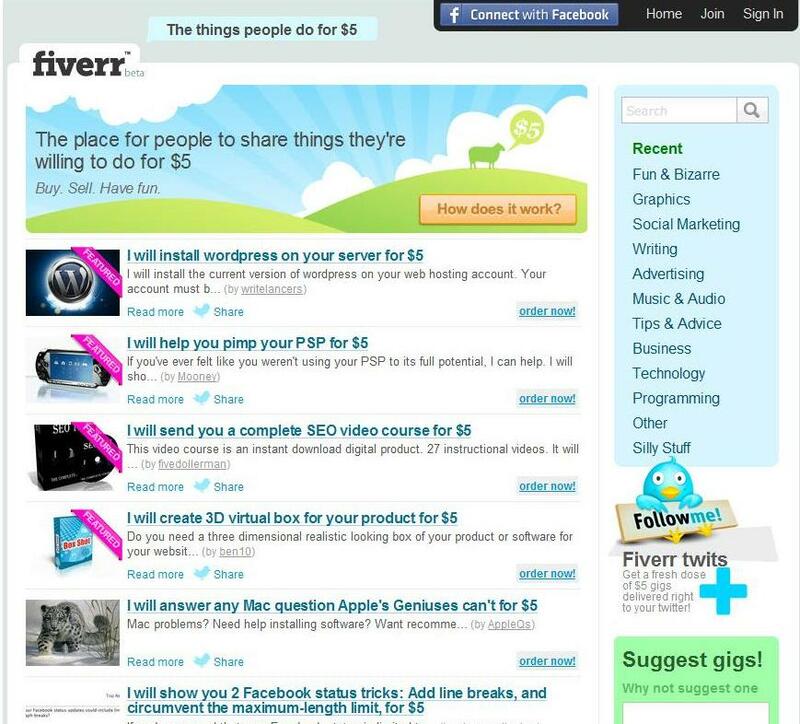 A Lot On Fiverr.com! What would you do for five dollars? What would you want someone to do for you for the low, low price of only $5? 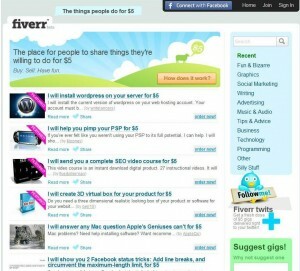 Recently, SmartMoney magazine ran a story about the website, Fiverr.com, where ordinary people offer up their services for a myriad of tasks for the flat rate of five dollars. How It Works. People sign up for a free account, then post what task or service they’re willing to do for five dollars. Although a buyer will pay $5 for a seller to complete a specific task, sellers only receive $4. The other dollar is kept by the site for payment-processing and fees, which is the primary way the site makes money. PayPal is the payment method and posting a job you are willing to complete is free. Types of Tasks. There are so many tasks that are offered by users of the website that it is even hard to list all of them. There are categories that the tasks fall into such as gift ideas, graphics, social marketing, travel, writing, advertising, advice, business, technology, programming, etc. For example, some of the featured tasks on Fiverr.com have been writing school essays, translating written words into Spanish, writing a love poem, sending out advertisements to large number of Twitter followers, sprucing up your resume, or even making Excel or PowerPoint graphs for you. If you do not see the exact job that you are looking to have finished, you can either search for it through the site or suggest it and hope someone takes you up on it. Who Would Benefit? The site is a good match during these rough economic times. Buyers are looking for cheap prices on services that they do not want to or cannot do themselves. And, sellers are often unemployed or underemployed people who are seeking freelance income. While a lot of people cannot earn an entire living completing task $5 at a time, there are some people throughout the world who can. Five US dollars is a lot of money in third world countries where people subsist on less than that per day. Another big source of providers for services is college students looking to make a little extra money and earn some experience doing work that they hope to get into after graduation. For example, there are several film students on Fiverr.com who are offering their services in making small one to two minute movies. Race To The Bottom. The site continues to grow and has recently surpassed 10,000 freelance workers offering their services. SmartMoney magazine raises the concern that we are setting a very low floor for some of the tasks that are being conducted on the website, such as editing and formatting your resume. It is a sacrifice that many people are willing to try. If you have a simple task that you want to outsource, you might benefit from checking out the site. Note – I like the site. I am a brand new user of the site, and I wanted to share it with you, my readers. I was not paid one dime by the website to promote them. I just thought that you would get a kick out of this new and novel resource. Does anyone have any experience with this site or others like it? I’d love to hear what you think in the comments section. This site is not doing any favors for people struggling to earn a living. It’s forcing prices even further downward. As an unemployed writer, I already see plenty of sites that pay freelancers $15 or $20 a story. Perhaps there are people who fancy themselves writers and would like to see their name online, but for those of us who do this for a living, it doesn’t come close to market rates. Sites like these encourage employers to sacrifice quality for the cheapest rate becus there will always be someone who can do it for less.